Arrive Alive exhibit more madness We suppose it's to be expected. After all, their policies never stood a chance of working. 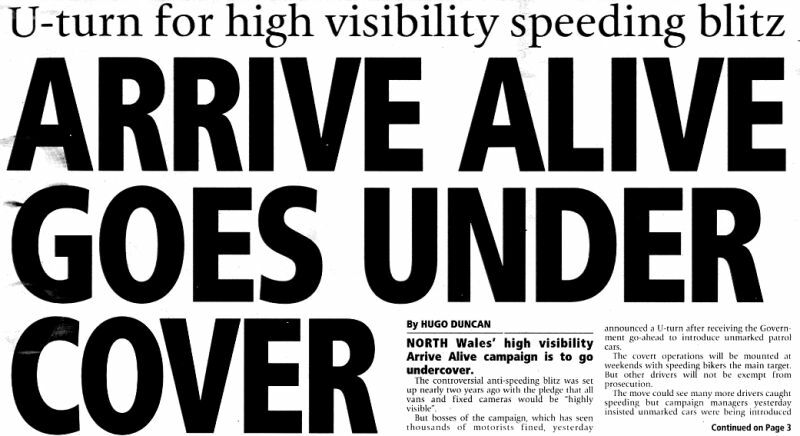 We heard yesterday from the Daily Post in North Wales about this new tactic from Arrive Alive. We gave a range of comments to the newspaper most of which didn't make it into print. The background to their new tactics are said to be due to a huge increase in biker fatalities from 7 last year to 13 in the first 6 months of this year - an increase of well over 350%. Obviously the rise in biker deaths has occurred in spite of Arrive Alive activities. So why would they think their activities are effective? In some of the cases of additional biker deaths it is likely to be true that recklessness played an important part. But that doesn't imply that they were reckless because they were speeding - far from it. It simply tells us that they were reckless. It's common for driving or riding to be reckless within the speed limit too. Research from Canada puts two thirds of inappropriate speed accidents as taking place entirely within the speed limit. If that research applies properly here in the UK and we think that it's very likely to be "about right" we know for sure that 2/3 rd of those excessive speed accidents are forever out of reach of Arrive Alive's bonkers speed enforcement. It should be obvious, therefore, that speed cameras are useless at preventing reckless and dangerous driving and riding. In fact the huge rise in North Wales biker deaths proves the point clearly. It remains to be seen exactly what their new strategy turns out to be, but it sounds awfully like a return to conventional roads policing. Let's hope we see skilled traffic officers dealing with bad driving and riding and leaving responsible motorists alone. It should also be clear that they don't have the first clue about the overall effects of their policies. Why would they now, suddenly, have to introduce covert vehicles? Don't they know already if covert vehicles are a good idea or not? He's another really important factor to consider. Bikers tend to be vulnerable to mistakes by other road users. Arrive Alive activities might be making other drivers more dangerous to bikers. We know well a range of plausible mechanisms. Drivers at enforced lower speeds tend to concentrate less well. If there's a risk of heavy policing drivers tend to look out for enforcement activity rather than real road risks, and some drivers may have given up some of their individual responsibility for safe driving to the authorities and now believe that they will be safe if they stick to the speed limit. Of course we're still waiting to hear their answers to our letter of 10th July 2003 (click here). BBC Wales ran the story too. (click here) We note that the BBC's understanding of the new plan involves putting speed cameras from mobile vans into unmarked cars. We'd really hoped that Arrive Alive had realised that they needed skilled traffic patrols. Sadly that does not appear to be the case.